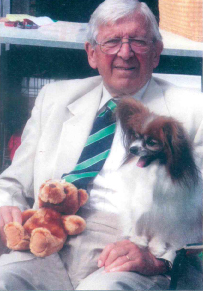 George Henry Morgan had a passion for dogs and a background in the Armed Services. George was born in 1928, meeting his wife of 61 years, Rita, when he was in his early twenties. Born in Hereford, George spent much of his adult life travelling as he spent 42 years in uniform having originally served in the Light Infantry rising to Warrant Officer and later Captain in the Territorial Army Volunteer Reserves. He served in Malaya fighting the bandits, in germany, Austria and was involved in the Suez crisis. George’s love of dogs was born out of Rita’s involvement with showing dogs. He became a steward at Crufts, retiting as Deputy Chief Steward! he gave so much of his life to the dog world, that it is an honour that in his passing, he has contributed greatly to the National Military Working Dogs memorial – a memorial to remember working dogs from World War 1 to the present day. The team at NMWDM charity would like to thank George and Rita, his wife, for their kindness and thought. We will be eternally grateful and in your honour.